This time instead of looking back on a visit here or there, I’m looking forward. But the basic idea is the same: enjoying Nevada. And I’m hopeful that the sunny skies will especially inspire the residents of Clark County, and in particular the Las Vegas Valley, to find their way out of the urban maze and discover the rest of the state. An expressive moment from last year’s Memorial Daze at Gold Point. There are all sorts of things going on out there over Memorial Day Weekend to lure you off the couch. 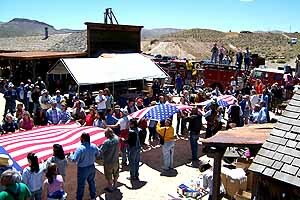 At Gold Point, for example, there is Memorial Daze. Gold Point is about 180 miles northwest of Las Vegas via US 95 approximately 165½ miles, stopping in Beatty to top off your gas tank so you’ll have an anxiety-free drive home. About 15 miles past Scotty’s Junction, Highway 266 turns off to the west by the Cottontail Ranch, a once famous bawdyhouse now fallen on hard times. Stay left at the fork in the road about 7½ miles along (Highway 774) and it’s 8 more miles to Gold Point. You can’t miss it. 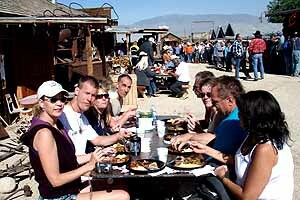 Gold Point is a revived remnant of pioneer Nevada, born in the heyday of desert prospecting, and Memorial Daze — May 25, 26, 27, 28 — is its big party of the year. Food is the focus, with a Dutch Oven Stew Contest on Saturday and a Chili Cook-Off (No Ingredients Outlawed) on Sunday, starting at 1 pm both days. But there are all kinds of events going on throughout the weekend: “Gunfights, Brothel Bed Races, Horseshoes, Pool, Poker, Hot Dog, Pie, Watermelon Eatin’ Contests, KiDS ZoNe! and more,” the flyer says. Music from 8 am (that’s right, ayem) by Stuck in Reverse, Gold Rush, The Art Jones Band and Maria. Sheriff Stone says, “Bring your sleeping quarters and some money and we provide the rest. The Nevada Landing on I-15 at Jean is closed and scheduled for demolition. We do breakfasts for $5.50 and steak and tri-tip dinners for $10 to $12. Chili and stew tasting is $5 for each day and that can serve as lunch for Sat. and Sun. or we will have Burgers with Fries or Hot Dog with Fries for $5. And on top of everything else, here’s an offer to readers of this effort: If you go, find Sheriff Stone or Red Dog Lil, introduce yourself as a NevadaGram subscriber, and you’ll get a wooden nickel good in trade for a cold beer, plus you can have your photo taken with them, a priceless memento and instant family heirloom. And, if you will send me an e-mail telling me the color of Red Dog Lil’s eyes, I will send you a copy of the Eulogy for Riley Grannan, an eastern gambler who died at Rawhide in 1908. Irresistable? I hope so. Or, head for Tuscarora for the 3rd biennial (that’s every other year, students) celebration of art and community. The Tuscarora Pottery School and 22 local artists will open their studios and showrooms (8 locations) May 26 and 27, 10 am to 4 pm. There will be music, hospitality of various kinds, an art performance, TONKIN, about Vietman, done on a table top on Saturday evening. The 4-H kids are providing lunch for sale, and at least one of the artists will serve home-made chili and corn bread. It’s good to remember that there are no stores in Tuscarora (15 full-time residents), nothing to buy except a 4-H lunch, art and postage stamps. Prudence dictates you stock up on refreshments in Elko and bring them with you. Futher information: 775-756-5004. I can’t offer you a cold beer in Tuscarora but if you send me an e-mail with the color of Elaine Parks’ eyes (she’s one of the artists, and be sure to include your postal address), I’ll send you a copy of the Eulogy. First it was just a single scout slipping unobtrusively into town, taking notes. That was on the 9th of January. Then on the 31st a car full of men in suits appeared, Sony execs, who let it be known they were considering Laughlin as the setting for the remake of a successful British television show, “Viva Blackpool!”. In the American version, Lloyd Owen stars as Ripley Holden, who hopes to turn his small-time casino at the edge of the Colorado River into a dreamy, Las Vegas-style resort. Oh, and everybody sings. Melanie Griffith plays a schemer with a past interlude with casino entrepreneur Lloyd Owen. Hugh Jackman also guest stars in the pilot, and they both may play recurring roles if the series is picked up. 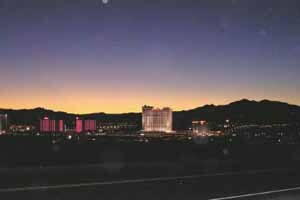 In late February the Sony people called the Laughlin people to say they were coming to shoot the pilot, and in early March 130 people came to stay at the Edgewater Hotel & Casino for three days of location shooting. They used Don Laughlin’s penthouse at the Riverside Resort for Hugh Jackman’s character because of the magnificent panoramic view. 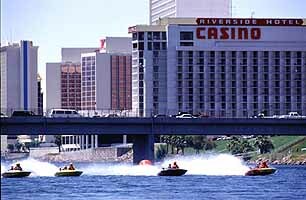 They did some filming along the river walk in front of the Pioneer, and they filmed actors driving back and forth along the glowing Casino Drive. The pilot will broadcast in the fall. If it succeeds, twelve more episodes will be made and Laughlin-consciousness will rise across America. And if not, well, that’s show business. 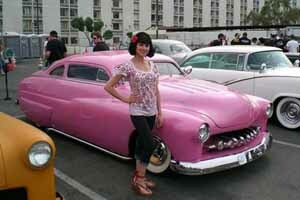 It’s Viva Las Vegas Rockabilly Weekend! And you’ve got to see it to believe it. The Rockabillies come from all over the world and provide an unforgettable presence at the Gold Coast and Orleans hotels. They’re west of I-15, in a neighborhood made fashionable by the Rio and the Palms. Hot chicks and cool cars — or is the the other way around? DAs have gone gray, or survive as combed-over parodies of their former glory, but the look hasn’t changed. And the younger people are even more into it! The Las Vegas gathering started at the Gold Coast in 1998, and like the swallows to Capistrano, the Rockabillies return there every year in ever larger numbers. The Rockabilly phenomenon is all about drama and emotion. Now the gathering so dominates the Gold Coast that it is sold out for the weekend, and one complete tower at the nearby Orleans has been set aside for the Rockabillies too. Some 18,000 attended the car shows, strictly limited to pre-1963 cars. Music audiences totaled more than 5,000 this year. Participants in the Burlesque Shows are chosen in advance online. La Cholita was the top vote-getter among this year’s candidates. Her self-portrait: “Half Glamour Half Gangsta and as hot as a shot of Tequila! I would love the opportunity to twirl my tassels. . . .” But how can you choose with slick chicks like Flame Cynders, Ophelia Handful and Bonbon Vivant in the running? One of the two new NNRY passenger cars arriving by (ugh) truck. 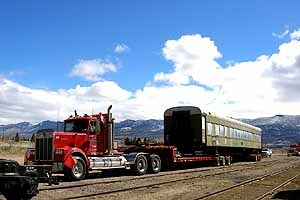 The Nevada Northern Railway recently acquired two railroad passenger cars with years of service with the Ontario Northland (ON) railroad in Canada. After they left the ON, they wound up on a tourist railroad in Ohio which eventually went bankrupt and needed to liquidate the cars. They’ll augment passenger service on the NNRy and serve to back up the creaking relics now in service. 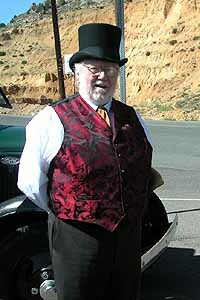 Bill Fain, proprietor and impresario of The Gold Hill Hotel, recenty celebrated his 80th birthday with a party that is still echoing in Gold Canyon.
. . . 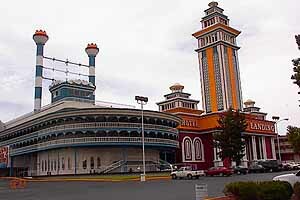 Landmark Nevada Casinos for sale: Hal Holder collected Nevada casinos the way other people collect stamps. And he has some beauties. 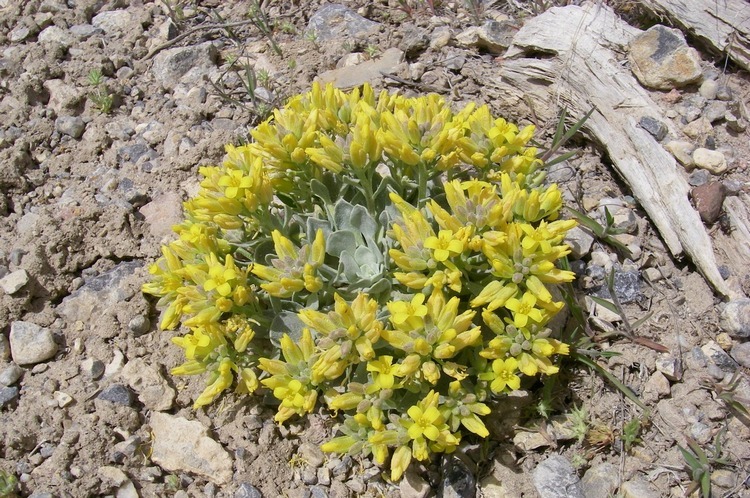 The El Capitan in Hawthorne, the Silver Club in Sparks, The Stockmen’s and the Commercial Hotels in Elko and the Red Garter in Wendover as well as others smaller and less prominent. Now the collection is being dispersed, and these landmark properties will soon be under new management . 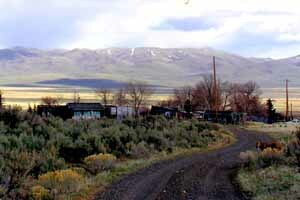 . . Did you miss the Cowboy Poetry Gathering in Elko? Maybe not. A lot of it has been preserved for your online viewing pleasure here . . . The Carson Valley Inn annual rafting outing on Saturday, June 2 has been canceled due to unusually slow water flow on the Carson River brought about by low winter precipitation levels.